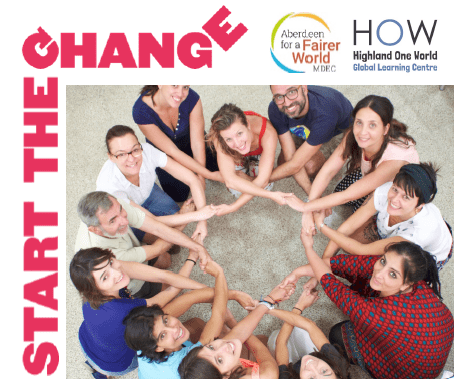 Start the Change Teacher Training – More information confirmed! Are you passionate about educating for a better world? Do you want to start the change? We are delighted to announce more information about this exciting teacher training session! 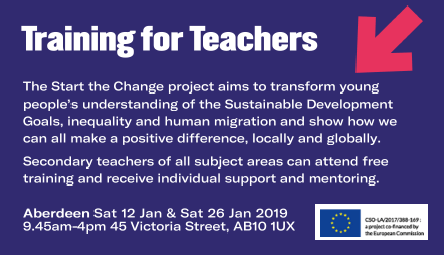 We are looking for enthusiastic secondary teachers and youth workers to be part of an exciting new transformative EU global learning project on issues around inequality and migration – Start the Change. Start the Change is a European-wide project, involving teachers and young people from 12 European countries. It aims to support Learning for Sustainability and active Global Citizenship in young people, with a focus on exploring issues around the Sustainable Development Goals and migration. It offers free training and individual support to develop a unit of work for learners on relevant themes, as well as funding to support youth-led action in schools or local communities. Training in Aberdeen will be on Saturdays 12 and 26 January 2019, delivered by MDEC and Highland One World. Contact Charlie Barrow, Global Learning Advisor at Montgomery DEC, Aberdeen: mdec.charlie@btconnect.com to sign up and for more information. The two day practical course will cover learning for sustainability and global citizenship education, the UN Global Goals, links between migration and inequality. It will also explore different approaches to transformative education, such as storytelling and service learning. Find the agenda for the two days here. Expert speakers include Colm Regan, author of 80:20 Development in an Unequal World. He’s been at the forefront of Development Education worldwide for decades!